New Delhi: India’s wholesale prices rose more than expected in October as the cost of food and fuel increased, raising doubts about the central bank’s outlook that price pressures will abate by the end of the year. The high inflation print, above 9% for the 11th month, was further evidence of the Reserve Bank of India’s (RBI) inability to achieve a breakthrough in its fight against inflation despite 13 rate rises since March 2010. Once again, analysts called on the RBI to pause in an aggressive tightening cycle that has hurt growth while having negligible impact on price pressure or expectations. “The October inflation number clearly reflects continued pressure from the core inflation front," said Rupa Rege Nitsure, chief economist with Bank of Baroda at Mumbai. “The RBI has exhausted the entire space to hike policy rates further but interest rates will continue to remain at the present elevated levels for a prolonged time." The central bank had said in its October review that further rate rises may not be necessary if inflationary pressures started to abate by December. That guidance by the RBI still holds and the inflation trajectory seems to be holding in line with expectations, said a deputy central banker on Monday. “If you look at our month-by-month projection in our policy statement, it’s very close to where we expected, both on the headline and the core (inflation). So in that sense, the trajectory seems to be holding up," Subir Gokarn said. Gokarn added that the interest rate cycle may have peaked. “We haven’t seen anything after that might suggest that we need to revise that guidance...so the guidance still stands based on both the growth number and the inflation number." The RBI had acknowledged in October that growth risks were discernible in slowing economic indicators, and yet it raised its policy lending rate, the repo rate, by 25 basis points. India’s inflation is the highest among major economies in Asia. Finance Minister Pranab Mukherjee said on Monday that wholesale prices in October were pushed up by higher food prices, and that supply constraints should be addressed to tame food inflation. Price pressures are threatening to drive inflation into double-digit levels, last seen 16 months ago, hurt mainly by rising rural wages and supply and transport bottlenecks. However, manufacturing inflation, which the central bank is believed to watch more closely, eased to 7.66% in October from 7.69% a month ago. The RBI, which has been the world’s most aggressive central bank in fighting inflation, has now become an outlier as the risks of a global economic slump and fallout from Europe’s debt crisis grow. Some analysts say this aggression has not yielded results yet, but December may see a change. “We expect inflation to start falling in December," said Dariusz Kowalczyk, senior economist and strategist at Credit Agricole CIB in Hong Kong. “The RBI is likely to stay put, waiting for a decline, and may well cut the cash reserve ratio in early 2012." Elsewhere in Asia and in parts of Latin America, some central banks are moving to a more accommodative stance or preparing to do so in the face of mounting global risks, with central banks in Indonesia and Australia cutting interest rates in recent weeks and others such as the Bank of Korea toning down their rhetoric on inflation. 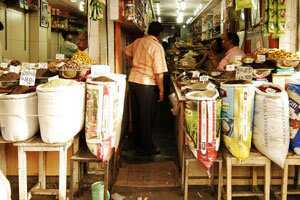 The RBI has left its forecast for WPI inflation by March 2012 unchanged at 7% while downgrading growth forecasts, acknowledging it expects high inflation levels to persist for a further two months and warning of risks of a premature end to policy tightening. To some economists, it suggests unwillingness on the part of the bank to recognise that rate rises have had little impact on inflationary pressures and instead inflicted heavy damage on investment. Indian federal bond yields and swap rates inched higher after the higher than expected inflation reading. “Data is in line with expectations. I don’t think the RBI will lower its vigil yet on inflation concerns," said Kumar Rachapudi, fixed income strategist at Barclays Capital in Singapore. The most-traded, new 10-year 8.79%, 2021 bond yield rose 1 basis point after the inflation data. It had ended trading on Friday at 8.94%. The benchmark five-year swap inched up 1 basis point to 7.38%, traders said. Indian shares reversed gains. Automakers, one of the most sensitive to inflation and interest rates, led the fall. Data on Friday showed India’s factory output grew at its slowest pace in two years in September, suggesting high domestic interest rates, worries about Europe’s debt crisis and fragile global demand were dampening industrial activity in India. Local food prices, which are largely outside the domain of monetary policy, have risen sharply in October. With little effort on the part of the government to ease supply-side pressures, food is a key contributing factor to high inflation. Food price inflation in October accelerated to 11.06% from 9.23% in September, driven by higher prices of perishables such as pulses and vegetables and those of high protein items such as milk, eggs, meat and fish, reflecting changing dietary patterns due to higher disposable incomes. Last week, state run refiners raised gasoline prices by 2.7%, the fourth increase in a year and a move which will further stoke inflationary pressures in the economy. The economy has also been hit by a depreciating rupee which fell to its lowest level in two and a half years on Friday, thus making oil imports more expensive. India imports 75% of its oil consumption. Core inflation, which excludes food and fuel prices, is still high, indicating persistent price pressures in the economy. However, Subir Gokarn, a deputy governor of RBI, said on Friday that interest rates may have peaked and he sees inflation moderating, reinforcing expectations the central bank will pause its policy tightening at its next policy review in December policy.